On 16 & 17 November this year, a weapons and military expo of 500 of the world’s largest arms dealers will converge on Auckland’s Viaduct Harbour. Alongside this, the NZ Navy has invited warships and war-makers from across the globe to “celebrate” its 75th birthday. War is nothing to celebrate in our view. We now live in an age of unparalleled human calamity caused by war — fueled in numerous direct and indirect ways by the arms industries. As many of us know first hand, wars are no longer an isolated offshore phenomenon: we all are, and will, pay for this wholesale destruction of human life one way or another. Do spread the word once you’ve soaked in this appalling news yourself. While not all of us may regard ourselves as the stereotyped marching protester, there are many ways to make your own ethical stand against the celebration of this phenomenon of war for profit. For some of us that may include greater awareness of the extent of this reality. 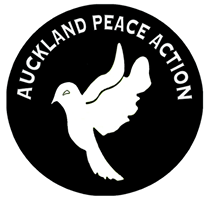 Peace Week is coming up & Parihaka is here!! These events relate directly to the integrity of our nation. Your spirit to meet all the goodwill behind them is much needed!! SO: below is your Kiwi response: a full smorgasbord of Peace initiatives in response to the week of upcoming war celebrations — just check it all out!!! 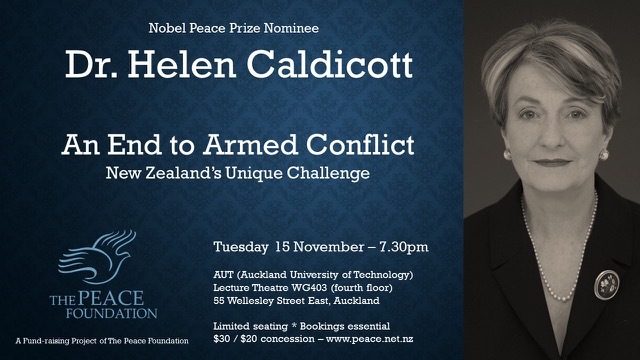 Organised by: The Peace Foundation (Foundation for Peace Studies Aotearoa/New Zealand) — Click here for Flyer. Navies, Warships, Arms: War and Peace? 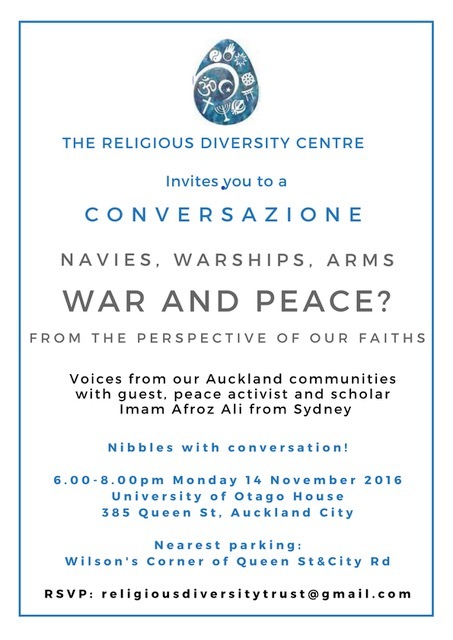 Organised by: Religious Diversity Centre — A “Conversazione” — Click here for Flyer. From NZ to Global Lessons of Peaceful Responses to War with Maori Indigenous Rights leader Marama Davidson, Apartheid Veteran and Kiwi Achmat Esau, Aussie Faith Leader Imam Afroz Ali. 16 November 7pm at St Columba Centre. Click here for Flyer. Organised by: Council of Christians & Muslims, Auckland. Just War Theory but “just” for whom? The Dorothy Brown Memorial Lecture 2016 with Dr Jenny Te Paa Dean of Te Rau Kahikatea. Former Chair of International Anglican Peace & Justice Network. Fri 18 November 7:30pm at Holy Trinity Cathedral Auckland. Click here for flyer.